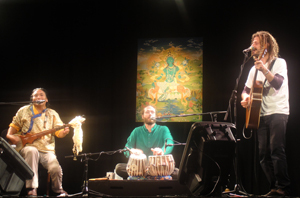 Rollicking Tibetan folk, afro-reggae guitar grooves and intricate Indian tabla sound as if they were made for each other! Together, Tenzin Choegyal, Marcello Milani and Shen Flindell create a new joyful sound that transcends cultural boundaries. Tibet2Timbuk2 has an eclectic repertoire resulting in an overall sound which is full and organic. All three musicians share melody, harmony, bass and percussion roles to create a solid yet easy groove. From the joyous to the meditative, come on a journey from Tibet to Timbuktu. Tibet2Timbuk2’s album “Music is Life” (2008) is available for mail order or download from EthnoSuperLounge.